Tenuta Santa Caterina wines accompany any menu from antipasto to main courses. Then comes the grand finale to the meal, for which there is Aqua Gratiae, a series of refined grappas or aquavits made by distilling selected, separate marc from Chardonnay, Sauvignon Blanc, Barbera, Freisa and Grignolino grapes. White grape grappa, Chardonnay and Sauvignon blanc, is obtained from distillation of the virgin marc, in other words obtained by simple squeezing, without involving the must. In this way, the marc remains particularly rich in sap and sugar. The result is a soft fragrant grappa. The fermented marc from Freisa and Grignolino grapes is distilled to give a traditional grappa, with all the fragrance and structure of the original grapes. Finally, Barbera marc produces a grappa that is aged and refined in French oak barrels for about a year. Tenuta Santa Caterina entrusts the production of its grappas, on a par with its wines, to the historic Marolo distillery in Canale d’Alba, which still uses the ancient bain-marie pot still method. 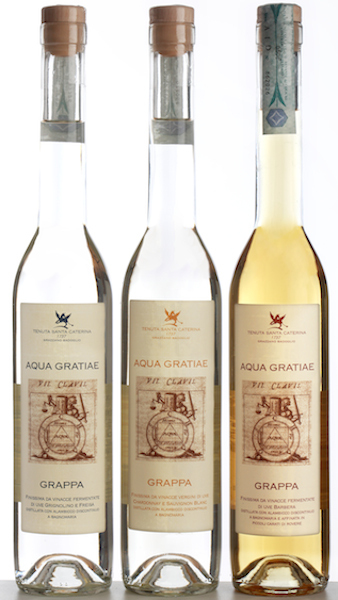 Grappa is an exclusively Italian product, the millenary statement of the art of distillation in this country. Acqua Gratiae is a name that summerise the indications of the place (Grazzano, named after Gratius, commander of a Roman centurion at the orders of Julius Caesar in the “bellum gallicum”) and at the same time has the ability to summon the alchemic origin of the distillate.